Love Actually sequel will see Rowan Atkinson reprise shop assistant scene…in Sainsbury’s! 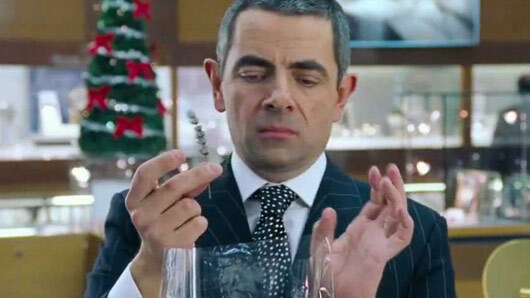 The Love Actually sequel for Comic Relief will see Rowan Atkinson reenact one of the film’s funniest scenes. Red Nose Day director Emma Freud tweeted pictures from the filming set yesterday, as she teased fans with suggestions of a mystery star. Finally revealing who the big name was, Freud shared a snap of the one and only Rowan Atkinson; AKA the agonisingly slow shop assistant Rufus. The actor will be making a comeback to the sequel as the character who originally worked on a fancy jewellery counter. However, years down the line Rufus has secured a new job at Sainsbury’s. And of course there’s a massive queue at his till. Freud tweeted pictures of Rufus taking his sweet time as he serves shop customers, as well as photos of Atkinson chatting to her partner and the film’s director Richard Curtis in between takes. Earlier this month, Richard talked about how much he has enjoyed working on the script. He said: “Over the years I’ve enjoyed doing Red Nose Day specials of TV things I’ve worked on – Blackadder, The Vicar of Dibley and Mr Bean. “It seemed like a fun idea this year to do a special sketch based one of my films, since Red Nose Day is now in both the UK and America. The filmmaker also expressed his gratitude to everyone who was willing to get involved with the sequel. Red Nose Day Actually will air March 24 on BBC One.